A used Ultimate sporter in very good condition. Originally supplied by ourselves, comes with 2 magazines, filling adaptor and instruction manual. Latest model from Air Arms S510 Regulated in a Walnut stock. 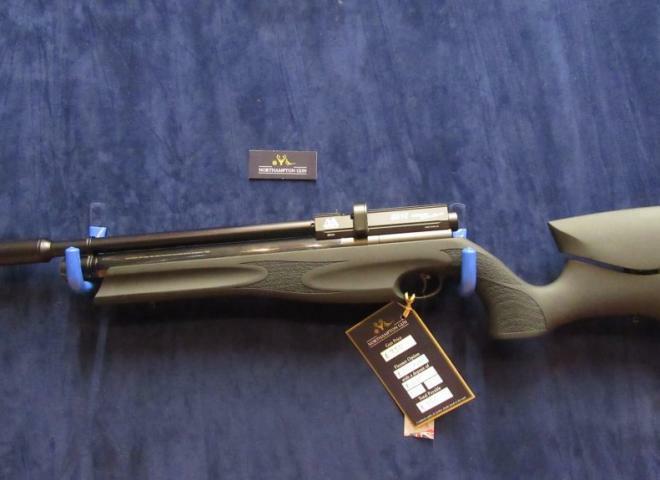 Latest model from Air Arms S510 Regulated in a Laminate stock. comes with hard case, stirrup pump topped with a Hawke Vantage 3-12x50 Airmax 30SF. New, With Box and 10 Round Magazine and Shrouded Barrel. Lovely Gun Fitted With a Moderator. S510, recoiless action. •Sidelever, 10-shot Self Indexing Magazine. •Superb two-stage, adjustable trigger.•Match-accurate ultra-carbine barrel. Latest model from Air Arms Ultimate Sporter Regulated Laminate comes with 2 x 10 shot magazines adjustable cheek piece fill probe etc and sound moderator. Latest model from Air Arms Ultimate Sporter Regulated Soft Touch Black comes with 2 x 10 shot magazines adjustable cheek piece fill probe etc and sound moderator.